Is it Monday already? Seemed like the weekend just started. The weekends go by so quickly don’t they? Well here is a little Monday Photo Inspiration for you. I took this photo from the top of Spencer Butte in Eugene Oregon. We had climbed this butte as a family and stayed to watch the sunset before realizing we had no light to get back down. Despite many raised eyebrow looks from the wife we had a great adventure and got to see the lights of Eugene glowing through a fog bank that was rolling in. No matter how negative or problematic a situation might seem there is always a silver lining or bright side. Happy Monday! 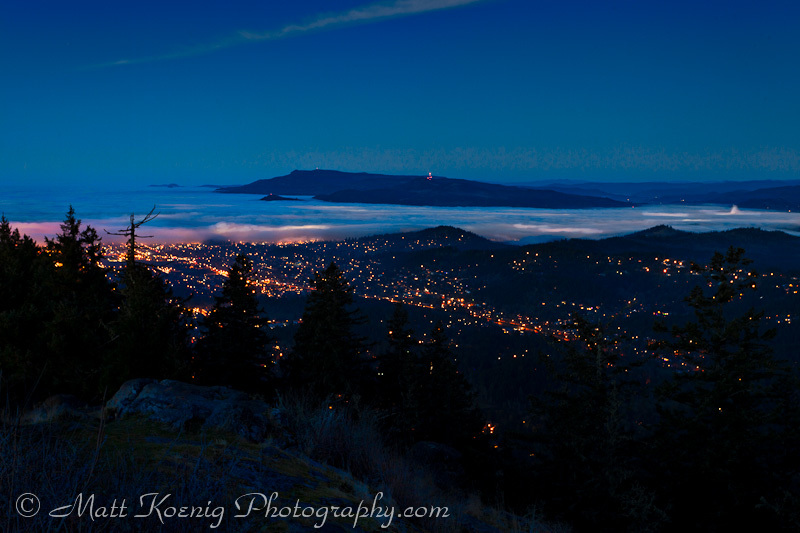 The city of Eugene being engulfed by a fog bank as viewed from the top of Spencer Butte. Canon 5D Mark II | ISO 50 | Canon 17-40 f/4L @ 40mm | f/11 | 30 sec. I like your photo. It looks like something you would find on a postcard. The fog bank rolling in in the distance adds some interest too.